Doll clothes designer extraordinaire. 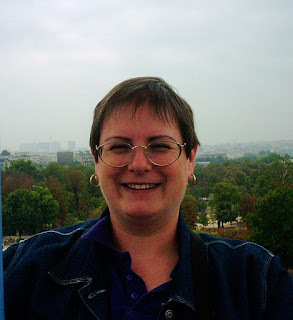 Genine resides in England and adds a European flair to many of her designs, she also has a knack for translating the fashions we sew for our little girls into one for dolly too, so they can have matching outfits. 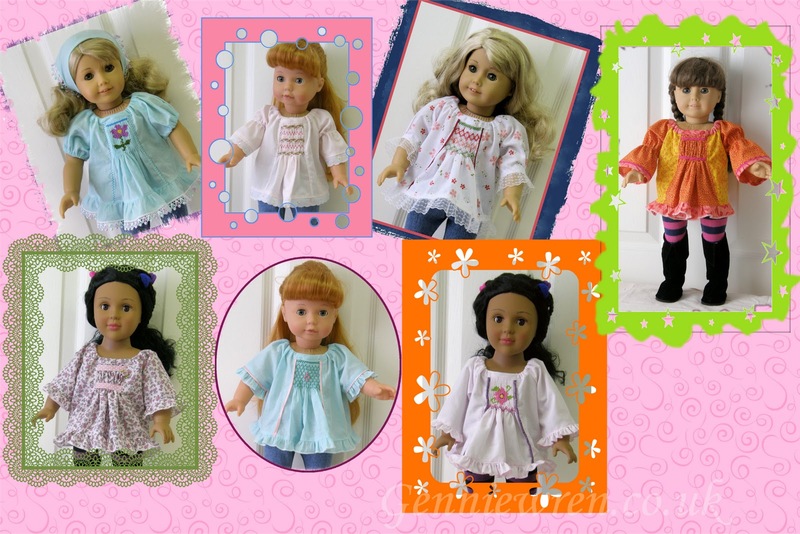 Genine designs for 18" dolls and gives excellent instructions to compensate for variations of different doll body measurements as not all 18" dolls have the same body size. Each pattern comes with several variations as you can see here with the Katya pattern. I am honored to be a tester for Genine's patterns and Sam thanks her for letting her get off the shelf and being able to play again. I have a special little girl that will be getting a new special friend for Christmas and she will come with lots of new clothes. You can purchase Genine's patterns through her Etsy shop. new patterns are added often so keep checking back. 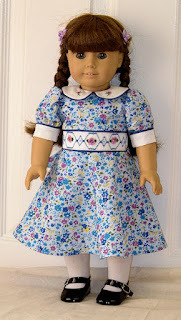 Sam wanted to show you the outfit she wore to the quilt show. 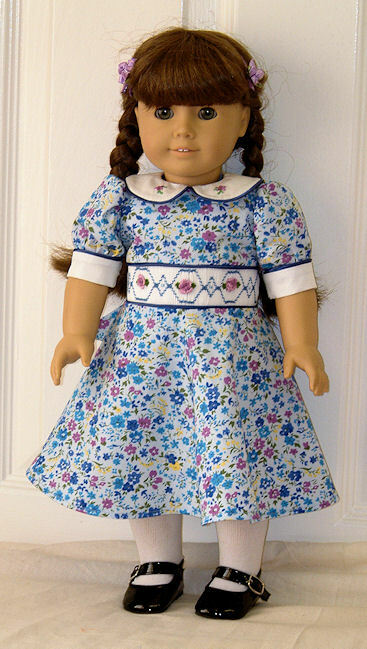 Our smocking group has a raffle each year for doll clothes and Sam did some modeling. 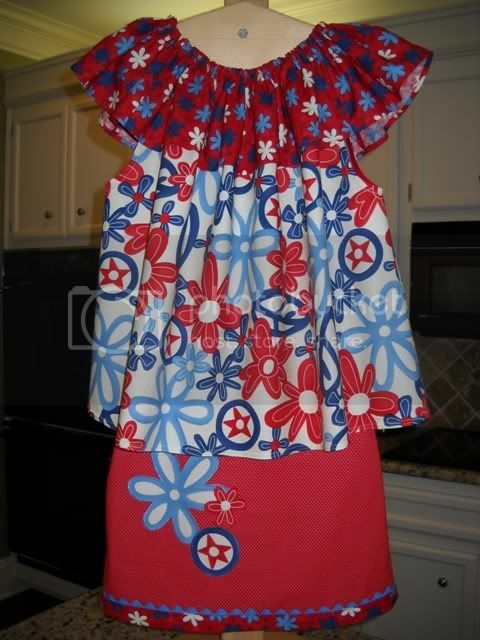 If you think I am having way to much fun sewing doll clothes you are right!! This top has a touch of smocking. The perfect amount for leaning to smock. The version can also be made without smocking. Hello, my name is Samantha, my friends call me Sam. I used to have a little girl to play with but, as with all little girls she grew up. I went to the shelf at grandma's house. I have some stuffed animal friends that also got left behind, it's just not the same as having a little girl friend to play with. I was pretty darn sad for awhile. One day, grandma came and took me off the shelf. Where was I going? What was going to happen to me? I must confess I was pretty scared. Grandma took me to her sewing room and gave me a new outfit. Then she let me go outside and play. I was so excited and happy. It seems grandma, has found a designer of doll clothes and is enjoying playing with me. I have been very busy modeling new clothes and playing with grandma. She even took me to a quilt show, so I could model a new outfit. 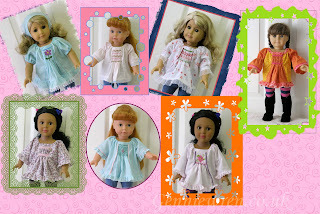 Now, I know you will want to make new clothes for your dolly and I don't think you could find cuter clothes for doll's with a custom touch. Oh, you don't have a doll? Well, I bet your daughter or granddaughter does and what better way to share then making some doll clothes. I am reposting this with permission. I just thought this was so clever I had to share it. Also, having the little ones grow and the fabric stash full of pieces that are now to small for a complete outfit, it really was a post that I needed to spark some creativity so I can use up those pieces in my stash. I love the way Jerry’s mind works, from play clothes to heirloom sewing she just amazes me. In her own words I will let her lead you through this project. 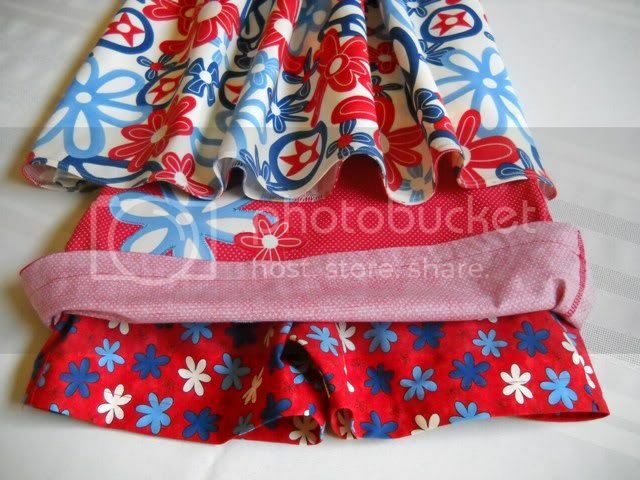 I bought these floral coordinates at Continental two summers ago when they were clearing out their summer fabrics. I bought exactly one yard of each. Since I didn't really have a plan in mind when I bought the fabrics, and since I am now making size 8s for MK, I had to really be creative in using them!! (read....figure out how the heck I was going to get an outfit done using them. ). I had bought a cute new pattern at Continental a month or so ago, but darn if it didn't take 1 3/4 yds of one fabric and 7/8 yd of another....just for the top/dress. 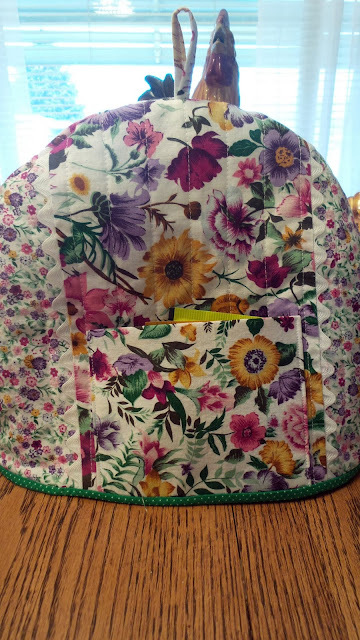 So I put on my thinking cap to see if I could approximate that design and used my Chery Williams basic bishop pattern in size 8 and cut the one yard of the "white" ground floral into a bishop front and back after tearing it in half. That gave me an 18" top, which will be shorter than most I do for her now. But since it is loosey-goosey, I think that will allow it to be cool and comfy to wear. I used the angel sleeve pattern to start the contrasting ruffle and cut the sleeve portions, then laid that down on both the front and back and drew a line the length of the sleeve all across both the front and back dress pattern pieces; then I cut pieces of the contrast corresponding to those pattern markings, giving me a ruffle to go all around the top. I seamed the pieces together, then ran some bias tape on the sleeve section tops only so that when I sewed the ruffle to the dress and flipped it over to the front (sewed right side of ruffle to wrong side of dress), I could press the bias tape down and have enough room to sew a 1/2" casing all around to run the elastic through. Did you get that? I simply serged around the bottom of the top and pressed that under and top stitched around with my 4.0 double needle. I used CC Sara's Skort for the little bottom. So it is a skirt with shorts attached at the waist. I found that little red pin dot fabric at Hancock's yesterday and didn't know at that point exactly what I was going to make to go with the top, so I only bought 3/4 yard. Last night I thought a little skirt would be cute, so I got that pattern out and used my remaining small floral to make the shorts. Instead of lining the skort, I chose to cut my scraps into bias strips to bind the bottom and trimmed it with delft blue rick-rack. Sure wish I had another pack of it. I would have loved to have added the same color rick-rack to the bottom of the ruffle edge. 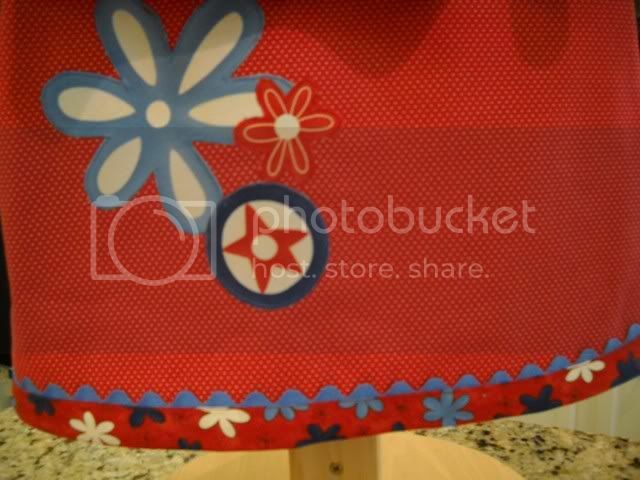 I then fussy cut three of the dominant shapes from the "white" background floral and fused them to the skirt off center toward the right side and then appliquéd them the old fashioned way on my sewing machine. To me this looks like a "big girl" outfit....and that's a little sad. You know how you start talking about one topic and soon you realize the topic has completely change as if in mid sentence? Exactly what just happened on a topic posted on the ES forum. The topic started as a question by one of the members that had just spent time looking at lovelies posted in the gallery, she noticed that a lot of the names of members who had posted the pictures do not appear to now be members, so she wondered where they went. So now, where does blogging come in? Well one member suggested maybe more of them had moved to blogging and were not spending the time on forums. That really got the ball rolling. What members now have blogs? The pitfalls and blessings that come from haveing a blog. 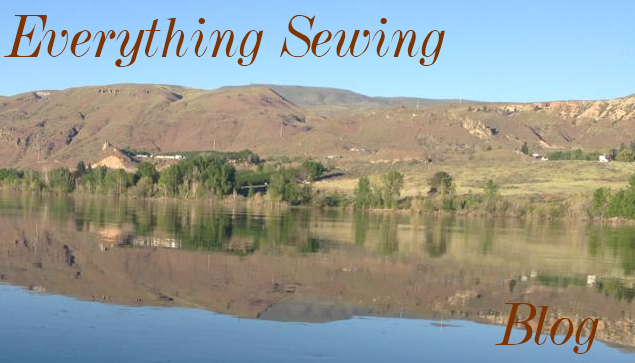 It really made me take a new look at blogging, I started so I could share my passion for sewing and anything beautiful. Some blog to promote their business, some to share their passions, friendship's are formed because we have the same interest or have gone through the same ordeal. Some blogs seem to just show how to make things or do things, others seem more personal and you get to know a person you would never have met if it were not for this person sharing themselves. Now, the reason for following or not to follow seem to be different. Leaving a comment is difficult for some as they feel there is little opportunity for interaction, other then leaving the comment to which the blogger rarely responds. I enjoyed our conversation about blogging and being on a forum format, being able to respond to each other in 'real' time was something I also enjoyed. I hope I learned a lot, I have rethought the blogging thing and know I will never have a huge blog, I will just enjoy the people I meet through blogging. I know there are many, many blogs that share sewing but we each have a little bit different way of doing something and if I can follow someone through a process of their sewing I will learn something new. So there are a few thoughts about blogging. I would love to hear your thoughts. Maybe, tell why you blog. What do you like about it, what do you not like. Fabric widths vary a bit, and the ladies at the cutting table are human. Lay your two pieces of fabric out one on top of the other to ensure they’re the same size. Trim up as necessary. Set the bottom piece aside when you’re done. With the sewing machine, sew trim to quilt top about ½” from the edge of the fabric. The trim edge that is supposed to show goes toward the inside of the square. Run ends of trim off the edge of the fabric. Later this will hide in the seam. Now you’ll make a quilt sandwich. Start with your bottom fabric facedown, then batting, then top fabric face up. Starting in the middle, baste with the quilt pins. Smooth the fabric as you work. I do this on the floor – my kingdom for a big table! Try to have your pins all “face” the same direction; this will be helpful in the next step. You’re almost ready to tie! Your batting package will tell you how far apart to tie – generally 4-6” is the rule (samples are tied every 4.5”). If your top fabric has an even pattern to it, you can use it to space your ties. If not, you have some options. In the sample quilts, the bottom fabric had a grid pattern. I laid the basted quilt out bottom up, and used straight pins to mark the grid. On the top side, I marked each pin with tailor’s chalk and then removed the pins. Helpful hint: have your marking pins run in a different direction from your basting pins so you’ll know which are marks and which are basting! Thread your yarn needle with a long piece of yarn. Pull the yarn through the eye of the needle until the cut ends are even. I start with about five yards. If you find this too cumbersome, you can use shorter lengths and just rethread more frequently. Do not knot the end. Stitch, picking up your marked spots, leaving a 5” tail on the first stitch. Each stitch should take up about ¼”. Leave a tiny bit of slack between each stitch – you don’t want it taut, especially if your stitches are close together. Keep stitching until you’re done! Having all your stitches run in the same direction gives you a more uniform look. Snip between stitches. Take out the basting pins. Tie each pair of yarn tails into square knots. Remember “Right over left and left over right!” Granny knots will come undone in the laundry. Trim tails to a pleasing length. Woohoo, almost done! We’re ready to finish the edge! You have options. My favorite look is to turn the edges in (just flop ‘em under, wrapping the bottom fabric over the edge of the batting) and blindstitch by hand. You can also turn the edges in, pin, and topstitch with the machine (much quicker, but it’s easy for it to go wonky on ya). If you prefer a bound edge, skip the trimming step at the beginning and bind the quilt with a coordinating fabric (directions can be found in quilting books or online). This quilt is tied with variegated yarn (fun!) and bound with a coordinating plaid. Voilá! A darling handmade quilt! They make great baby shower gifts.